Housed in a corner unit of a luxury apartment complex, Kasih might be the last place you’d expect to find babi guling. The dish, a specialty of Indonesia’s southern islands, is usually the centerpiece at big feasts: whole suckling pig stuffed with lemongrass and turmeric, trussed up, and slow cooked over coals until its crackling skin turns the color of caramel. Suzanne Goin once served a version at A.O.C. years ago, inspired by a trip to Bali, but it’s hardly avocado toast around these parts. In the hands of Kasih chef Zachary Hamel, who grew up shuttling between Thailand and Wisconsin, babi guling gets reimagined as a burly porchetta, rubbed with garlic and chili paste and blasted in the oven until its skin puffs out like a porky Afro. Served with green papaya salad, it’s succulent in a way that requires no cultural preamble or geographic explainer, though the menu cheerfully offers one. If Kasih seems a little too insistent on culinary context, there’s a reason; the restaurant is backed by Wonderful Indonesia, the Bali-based tourism board, which is seemingly eager to raise awareness and perhaps lend contemporary cool to the archipelago’s homey cooking. Hamel, formerly the sous-chef at WeHo’s hip Thai-Fijian spot E.P. + L.P., is well-suited for the task; he spent four months training with chef Vindex Tengker, a judge on Top Chef Indonesia, to assemble a menu styled to match Kasih’s sleek, dark wood and floating lanterns. Though gorgeously plated, staples like nasi goreng (fried rice) and gado-gado (salad with peanut sauce) don’t slap with savory funk as they do at Indo canteens like Simpang Asia and Sate House. But Hamel is shrewd in his use of spice. 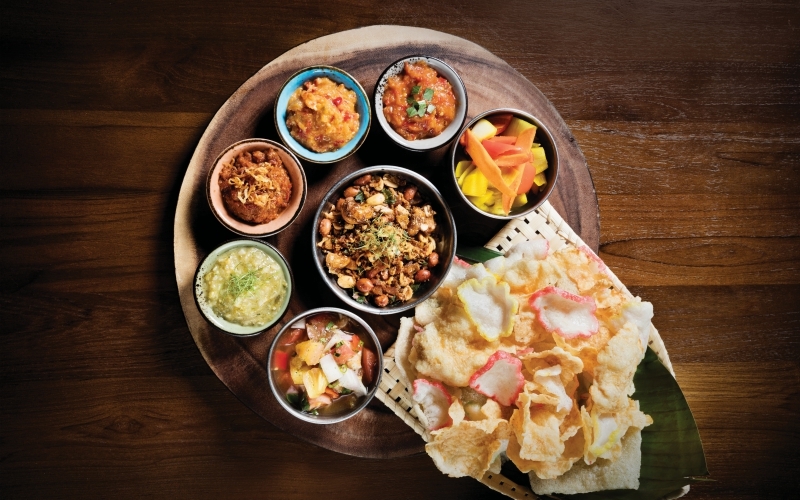 Paired with airy shrimp crackers, a colorful sampler of sambals—a half-dozen chili pastes tricked out with things like pineapple and roasted tomato—becomes a tantalizing spin on chips and dip. Santa Barbara lingcod, bathed in red curry paste and grilled in banana leaves, is as deeply fragrant as it is searing (Tip: The old-fashioned with banana-infused bourbon makes for a nice salve). The strongest dishes at Kasih are those in which Hamel lends personality to the traditional. Crisp squares of fish skin provide a briny anchor for snapper ceviche brightened with lime oil; strips of fried tempeh glazed in sweet soy become filling for lettuce cups. It’s not food you’ll see in a travel brochure, but that’s probably the intention. Kasih, 200 S. Los Angeles St., Little Tokyo. Next article15 Places to Get Your Outdoor Yoga Fix in L.A.